Darren Naish (born September 26, 1975) is a British vertebrate palaeontologist and science writer. He obtained a geology degree at the University of Southampton and later studied vertebrate palaeontology under British palaeontologist David Martill at the University of Portsmouth, where he obtained both an M. Phil. and PhD. He is also the founder of Tetrapod Zoology, it was created in 2006. 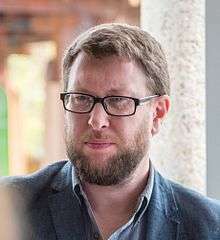 Though initially beginning his research career in palaeontology with the intention of working on fossil marine reptiles, Naish is best known among palaeontologists for his doctoral work on the basal tyrannosauroid theropod Eotyrannus, a dinosaur that he, together with Steve Hutt and colleagues, named in 2001. He has published articles on the Wealden Supergroup theropods Thecocoelurus, Calamospondylus and Aristosuchus. With Martill and Dino Frey, he named a new illegally acquired Brazilian compsognathid theropod Mirischia. In 2004, Naish and Gareth Dyke reinterpreted the controversial Romanian fossil Heptasteornis. Suggested by other authors to be a giant owl, troodontid or dromaeosaurid, it was argued by Naish and Dyke to be an alvarezsaurid, and as such is the first member of this group to be reported from Europe. Other fragmentary European alvarezsaurid specimens have since been reported. Naish has also published work on sauropod dinosaurs, pterosaurs, fossil marine reptiles, turtles, marine mammals and other fossil vertebrates, and he has also produced articles on other aspects of zoology. He published a series of articles on poorly known cetaceans during the 1990s and in 2004 published a review article on the giant New Zealand gecko Hoplodactylus delcourti. In 2004 he and colleagues described a giant Isle of Wight sauropod dinosaur that appears closely related to the North American brachiosaurid Sauroposeidon, and informally referred to as Angloposeidon. Prior to the 2006 description of Turiasaurus from Spain, this was the largest dinosaur reported from Europe. In 2005 he coauthored the description of the new Cretaceous turtle Araripemys arturi, and in 2006 he and David Martill published a revision of the South American crested pterosaurs Tupuxuara and Thalassodromeus. During 2007 and 2008, Naish and Martill published a major revision of British dinosaurs; Naish also published work with Barbara Sánchez-Hernández and Michael J. Benton on the vertebrate fossils of Galve in Spain. The Galve fossils are significant in including istiodactylid pterosaurs, heterodontosaurids and spinosaurines. In 2007, Naish co-authored the description of the bizarre new sauropod Xenoposeidon with fellow Portsmouth-based palaeontologist Mike P. Taylor. In 2008 he published an evaluation of azhdarchid pterosaurs with Mark Witton. In 2013, Naish described Vectidraco daisymorrisae, a small azhdarchoid pterosaur from the Isle of Wight. Naish has published several popular books on prehistoric animals including the Dorling Kindersley Encyclopedia of Dinosaurs and Prehistoric Life (2003, with David Lambert and Elizabeth Wyse), the Palaeontological Association book Dinosaurs of the Isle of Wight (2001, with David Martill) and the highly acclaimed BBC Walking with Dinosaurs: The Evidence (2000, with David Martill), produced to accompany the TV series Walking with Dinosaurs. In 2010, he published The Great Dinosaur Discoveries as sole author, and in 2016 the Natural History Museum book Dinosaurs: How They Lived and Evolved co-authored with Paul Barrett. His name is also attached to several children's books on prehistoric animals. Naish is an associate editor for the journal Cretaceous Research and was also on the editorial board of the journal The Cryptozoology Review. He acts as a regular book reviewer for the Palaeontological Association. Naish has appeared widely on British television, having featured on BBC News 24, Richard and Judy, and Live from Dinosaur Island. He appeared on a Channel 4 discussion programme on cryptozoology, presented by journalist Jon Ronson, during the late 1990s. Naish's research on the giant Isle of Wight sauropod "Angloposeidon", on the pterosaur Tupuxuara, and on the sauropod Xenoposeidon was widely reported in the news media. In 2006, Naish started a weblog, Tetrapod Zoology, that covered various aspects of zoology. In 2007 he joined the ScienceBlogs network. In July 2011, the blog moved to the Scientific American blog network, where it is currently hosted. Tetrapod Zoology seems to cover most subjects concerning tetrapods. Popular subjects commonly written about include frogs, dinosaurs, pterosaurs and cryptozoology. Together with colleagues Michael P. Taylor and Mathew Wedel, Naish also contributes to one of the most special-interest blogs in the world: the Sauropod Vertebra Picture of the Week site (or SV-POW!). Despite its arcane appeal, SV-POW! has received thousands of hits since its inception and has proved highly popular among palaeontology aficionados. In 2010, Naish published a collection of early articles from Tetrapod Zoology as a book titled Tetrapod Zoology Book One. Hutt, S., Naish, D., Martill, D.M., Barker, M.J., and Newbery, P. (2001). A preliminary account of a new tyrannosauroid theropod from the Wessex Formation (Cretaceous) of southern England. Cretaceous Research, 22: 227–242. Naish, Darren & Dyke, Gareth J. (2004): Heptasteornis was no ornithomimid, troodontid, dromaeosaurid or owl: the first alvarezsaurid (Dinosauria: Theropoda) from Europe. Neues Jahrbuch für Geologie und Paläontologie Monatshefte 7: 385–401. Naish, D. & Martill, D. M. 2008. Dinosaurs of Great Britain and the role of the Geological Society of London in their discovery: Ornithischia. Journal of the Geological Society, London 165, 613–623. Naish, D., D.M. Martill, D. Cooper & K.A. Stevens 2004. Europe’s largest dinosaur? A giant brachiosaurid cervical vertebra from the Wessex Formation (Early Cretaceous) of southern England. Cretaceous Research 25: 787–795. Naish, D., Martill, D.M. and Frey, E. 2004. Ecology, Systematics and Biogeographical Relationships of Dinosaurs, Including a New Theropod, from the Santana Formation (?Albian, Early Cretaceous) of Brazil. Historical Biology. 2004, 1–14. Naish, D., Conway, J., Koseman, C. M. All Yesterdays: Unique and Speculative Views of Dinosaurs and Other Prehistoric Animals. Irregular Books, 2012.